1987 - The JBA Owners Club was formed in February by Geoff Payne. Geoff is now an Honorary member and holder of the M.B.E. He obtained a list of owners from JBA Engineering Ltd., wrote to them all, organized a meeting in Manchester and a Committee was formed. Those elected were Geoff as Chairman. Don Humphries as Secretary. Doris Watson as Treasurer. John Beattie as Technical Editor. Albert Chandler as Newsletter Editor. (now called Magazine Editor) and Frank Carter as Social Secretary. With elections of the Committee the club came into being. Representatives were appointed throughout the UK. The Officials and Reps. stand for election once a year at the A.G.M. duties are carried out on a voluntary unpaid basis. The A.G.M. in the early days was held at various venues around Standish, Wigan after The JBA Open Day every April. 1991 - However, between 1987 and 1991 no other members applied for any posts and at the A.G.M. in 1991. Geoff made it plain that the club would benefit from a change of Committee and that the present officials would terminate their posts at the next A.G.M. 1992 - Geoff's wish was realised and 1992 saw a change of Committee. Geoff was succeeded by Alan Naughton as Chairman. Frank Carter moved into the Secretaries position and his wife Sue took over his old job as Social Secretary. This was the first husband and wife team in the club. Lol Lennox took over as Editor. Phil Schofield became Treasurer. A new post was created as Liaison officer taken up by Jack Vincent, as he lived close to JBA. This was to liaise with JBA Engineering Ltd. and try to resolve any problems or complaints from members. However this post was dissolved in 1996 as Jack hadn't received one complaint or problem to deal with. 1994 - Les Fragle took on the post as Secretary and Jill Fragle was nominated Social Secretary another husband and wife duo. Norman Raw became Treasurer. A new post as Vice Chairman was created to help spread the load of the Chairman's duties. Phil Hellon was nominated and accepted the post. 1995 - The venue for this years A.G.M. was changed to the The Kit Car Show, Stoneleigh, Warwickshire. Where it has stayed to the present time. John Dunbar accepted the post of Chairman. A new post of Marketing Officer was introduced to deal with all the club merchandise and Sue Regan was appointed. 1996 - Retiring from their posts this year Phil Hellon, Jill Fragle and Sue Reagan. Bob Reynolds took over the position of Vice Chairman. Ron Swift succeeded to the post of Social Secretary and Glenis Swift to Marketing Officer. These husband and wife teams are popular with the members. A new post was created as Advertising Officer to help bring revenue to the club. There were no takers for this role at the meeting. However Ann Henstock agreed to take on this post later. 1997 - The Chairman's post became vacant and Pete Henstock was nominated. Pete has been a regular contributor to the Club Magazine since the Eighties. This brings us to the Club Magazine Editors. The Magazine was started by Albert Chandler, followed by Lol Lennox, who introduced colour to the magazine. 1998 - Lol Lennox decided to stand down and was awarded Honorary membership of the club for his sterling work. He is the second person to achieve this accolade. The first being our founder member Geoff Payne. The magazine since then, is now in the hands of Brian Jones, who does the magazine on his computer, before sending it to the printers. Brian did have a go at the printing last year, but it was too much for one person. 2000 - Norman Raw the treasurer decided to stand down at the end of the year. Norman has served in this post from 1992. During the year he liaised with Mrs Val Hays who would take on the post from 01-01-2001. 2003 - Brian Jones stood down as Magazine editor and the position was filled by Darren Bovis-Coulter the webmaster for the club. Glenis Swift stood down as Marketing Officer and this position was later filled by Lesley Newman. Shortly after the Stoneleigh show Ron Swift resigned from his position as Social Secretary. 2004 - At the AGM Val Hays stood down as Treasurer and no one offered to take up this very essential post, after a long silence Donald Collier offered his services and liaised with Val over the next few months and took over officially on the 1st. August. 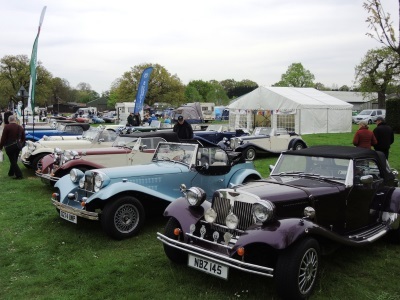 The Social Secretary's position was deleted as Area representatives were handling local events with the main kit car shows booked by the Club Secretary. In July the magazine editor Darren announced that he was standing down due to pressure of work. Robbie Gibson took over as editor with help from Darren and Lol Lennox. 2005 - On line in March the club had started this new web site, as Darren was unable to devote the time, due to pressure of work to maintain the previous web site. This totally new site was built by Robbie Gibson and contains a large number of pages from his own JBA Falcon web site. At the AGM Lesley stood down as Marketing Officer and the position was taken over by her husband Wayne Newman who would continue in this post for one year. Therefore the club would like to hear from any members wishing to take on this essential post to contact the Committee before the next A.G.M. which is on Sunday 30th April 2006. 2006 - This years AGM saw our Bob Reynolds giving up his position as Vice Chairman. No one volunteered to take on this post and it remains open. Wayne Newman stood down as Marketing Officer as mentioned last year and the position was filled by Peter Standing. Of the two vacant Area Representative posts the South West was filled by Gavin Dimmick with Northern Ireland remaining vacant. A rescue deal to save the JBA Factory was put forward by a Mr Ethan Taylor who asked to attend the meeting. The Officers of the Club made it clear that the JBAOC would not provide any financial support to this venture after receivinglegal advice. 2007 - Only one change at the A.G.M. at Stoneleigh this year, the South East representatives position has become vacant, no one offered to take up this position at the meeting. Our Secretary also announced that he will be standing down next year 2008. 2008 - Les Fragle our Secretary for the last 14 years stood down this year and the position was taken up by Peter Standing who is also in charge of the Club shop since 2006. 2009 - After twelve years service as Chairman, Pete Henstock stood down at the AGM even although he had previously announced he was standing down. None of the members expressed an interest in taking up this position at the meeting and the position would remain unfilled. However our South West representative Gavin Dimmick stood up and offered to take up the post and was dually nominated. The position of Advertising officer became vacant as Ann Henstock was also standing down, once again no takers and Donald Collier our Treasurer rose to the challenge and took on the position. 2010 - Three new Representatives appointed at the meeting Chris Jowett took over North East area from Keith and Val Hays and Sharon Robert filled the vacant South Wales area. Keith Frost filled the vacant South East area. North Wales has become vacant as Trevor Brown stood down due to ill health. 2011 - Following a suggestion by the Chairman, the members voted to split the posts of Website and Magazine Editor into two posts. George Hunt was elected to the post of Magazine Editor and Robbie Gibson to remain as Website Editor. A new post of Liason Officer was created to act as a bridge between JBA Motors and the Club. Chris Jones was elected to this post. 2012 - The Chairman redesigned the website and then the Secretary became responsible for it maintenance. A new committee post of Forum Moderator was created and Chris Valder volunteered to do this. 2015 - A new Chairman, Neil Benham, was elected and Gavin Dimmick took up the new committee post of Area Rep Co-ordinator. Chris Valder stood down as Forum Moderator the post is current vacant. Keith Frost stood down as Southern England Rep and the post was filled by Bruse Haggata. Neil Benham retired as Chairman and took over as the Rep for Wales. A new Chairman, Peter Standing, was elected and Stephen Fulcher became Vice Chairman. Mike McGarth took over as Editor of the Club's magazine and Phil Whittaker became the Rep for North West England. JBAOC flags were introduced for display at events.